Were it not for an unexpected stroke of luck, a set of twins would, by now, have been hanged to death in Kaida Village, Gwagwalada, on the outskirts of Abuja. However, the arrival of humanitarian workers 24 hours before their scheduled death left them a survival window that their mother bravely explored. 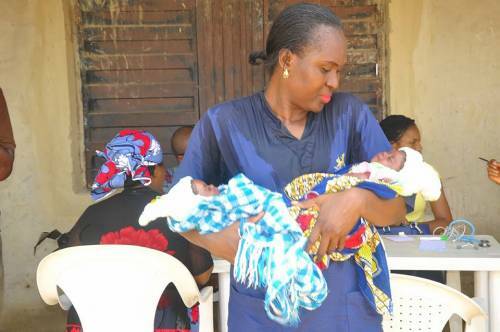 According to Nkwasi Obim Nebo, a maternal health advocate and humanitarian worker who led a team of PeachAid Medical Initiative medical doctors to the village, the mother of the twins walked up to her seeking help. Narrating the experience on Facebook, she wrote: "As soon as we arrived the community, this woman immediately handed us her newly-born twin babies, asking us to take them away; they were only 2days old. "I asked her why she was giving up on her kids, she replied and said they will be killed in few days from today if still with her. She heard we were coming and came out just to give us the babies! "This is her 4th pregnancy, and her 4th set of twins also! Oh yes! You heard me right! Twins are considered as evil in this community since time immemorial, and are killed (hanged) on the third day after delivery." "During our health intervention at Kaida Village, Gwagwalada, FCT, we made sure every woman got their choice of contraceptives which will last for 5years, and that the men present also got condoms as many as they wanted," she wrote. "We distributed clean delivery kits to prevent infection and bleeding at child birth; we checked their sugar level, and their blood pressure; we administered Vitamin A supplements for all the children between the age of six months to five years." Since Mary Slessor stopped the practice of infanticide of twins among the Ibibio in the 19th century, numerous individuals and groups have followed suit with nationwide campaigns on the rights of twins to life. Still, the practice persists — particularly in villages far flung form major towns and cities, such as Kaida.